There is no strength in our voice unless we are willing to raise it and demand equality. Every person has the power to create change and together we can be more effective. So, regardless of your deaf language preference or choice, we as The Deaf Community need to ensure access is provided to everyone and respect parental rights in this community too. 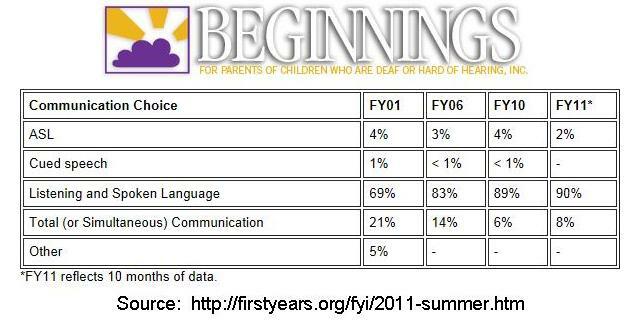 It's not about who's right, but about respect for all the deaf communication opportunities. Most of all, deaf children and their families need full access to equal and appropriate expertise opportunities for the child to reach their full potential in the chosen communication mode. We will truly amplify the impact of the ENTIRE deaf community if we work together to support ALL communication opportunities. Here are current legislative initiatives we are working on, with more states coming soon. We appreciate your support on these issues by contacting your legislator today. Members should log into their membership account for updates from their state chapter. all organizations respect parent choice. California TDC members are monitoring special education funding in California to ensure any funds allocated to children with hearing loss are fair and equal no matter what communication mode thid child uses. Legislation to provide up to $1,000 tax credit for two hearing aids. Congratulations to the advocates and the TDC team in Florida for your efforts to gain UNANIMOUS support of HB591 which was signed into law by the Governor in 2014. This is certainly a win for parents of babies who are born with hearing loss so that they receive prompt, unbiased information about intervention options from registered service providers. The national office of The Deaf Community sends props to the Florida Chapter of The Deaf Community on all your advocacy work to bring information to families. Congratulations to Choices Delaware and thank you to Representative Valerie Longhurst. The University of Delaware finally has a graduate program to train future SLP's with hopes of a LSLS program to follow. All the support in Delaware is appreciated. House passes budget with Opportunity Scholarship Act (June 2013): North Carolina House passes a budget bill that allocates funding for the Opportunity Scholarship Act. After weeks of debate, families are celebrating a legislative win that will allow low-income and working-class children to afford schools that could meet their educational needs. This is great news for deaf and hard of hearing children in North Carolina since this allows them opportunities to afford a quality school to meet their communication and learning needs. Every family deserves the ability to choose the best education for their child.